While many may claim that the AMD platform is dead for enthusiasts and gamers, the truth is that it is still a solid platform that works very well. It may not be top dog in terms of raw performance numbers, but it is still a valid platform for someone looking to put together a cheap gaming, folding or 3D modeling rig. The price of AMD Dual Core processors is absolutely amazing and this can make the entire platform worth looking into for many people on a budget. 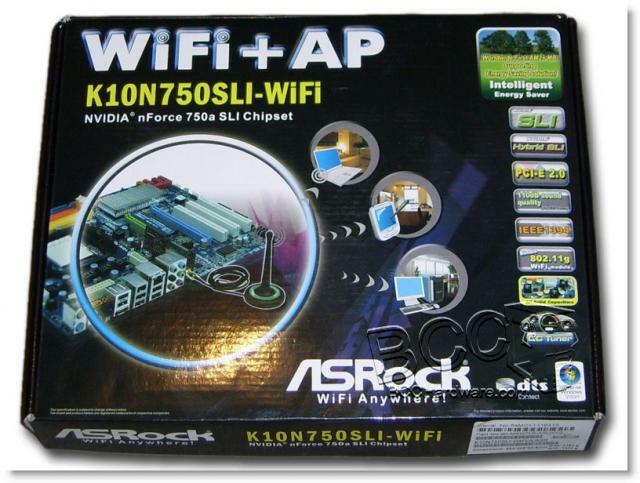 Today we are looking at the K10N750SLI-WiFi motherboard from ASRock. 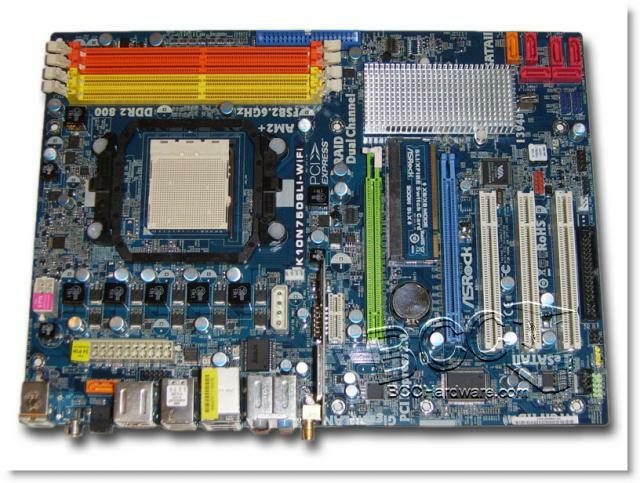 This board is long on features and it brings the new nForce 750a SLI chipset to the mainstream AMD platform. It also does this at a price point that is very inviting. Keep on reading as we take a look at the first AM2+ board we've seen in a while and find out if it offers nVidia's users anything worthwhile. When you first look at the box, you quickly see that this board has a lot of features normally found on much more expensive motherboards. From integrated WiFi, to Firewire, eSATA and even SLI it has a lot of features that we'd expect to see on premium ASUS boards for as much as $100 more. 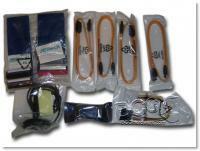 One thing that typically sets more expensive boards apart from cheaper ones is the bundle - or lack thereof. 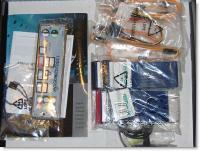 However, ASRock includes a floppy cable, IDE cable, four SATA cables, audio cable, WiFi antenna, PCI I/O bracket, and the obvious manual, CD, main I/O plate and driver CDs. Overall, it is a pretty inclusive bundle with PCI slot USB and Firewire brackets appearing to be the only major thing cut from the bundle. The board layout is pretty good on the K10N750SLI-WiFi as well. There is really no big problem area and the color scheme is pretty catchy. In truth, there really isn't much of a scheme, but it is flashy without being too overbearing. It would look great in a case with a window. The rear IO is pretty straightforward and there are no surprises here. ASRock still uses legacy PS/2 keyboard and mouse connectors while also providing a composite digital audio output as well as a optical audio connection as well. There is a total of six USB2.0 ports along the back as well as eSATA, firewire, and GB LAN ports. To complement the audio connections there is an 8-channel audio block right next to the RPSMA antenna connector for the integrated WiFi. To call the wireless integrated is actually not quite true as the wireless network chip resides on an add-in card that plugs directly into a motherboard header. 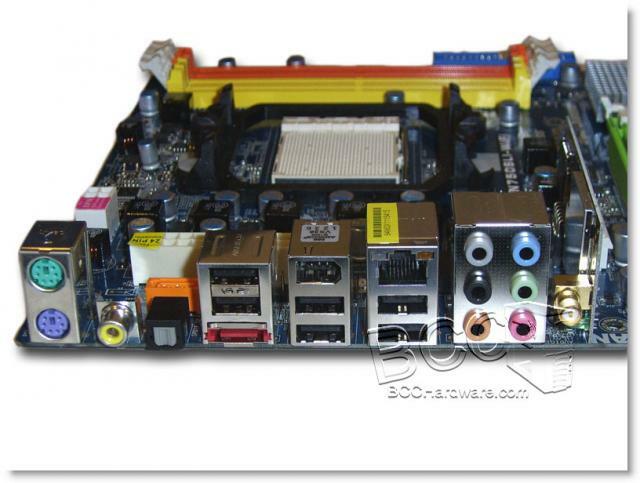 On the next page we'll take a closer look at this motherboard before we take a look at the features of the nForce 750a chipset and the boards specifications.